Market conditions have remained predictable in 2016, with not a whole lot changing since the year began. Low unemployment levels, as well as low mortgage rates, have kept the market active despite a lack of homes on the market. However, lack of inventory has been one of the major factors inhibiting market growth. Due to the growing popularity of the DFW area, it doesn’t look like it will rise anytime soon. North Texas Real Estate Information Systems (NTREIS) recently released their latest market statistics (October stats released in November) that backed up this prediction. 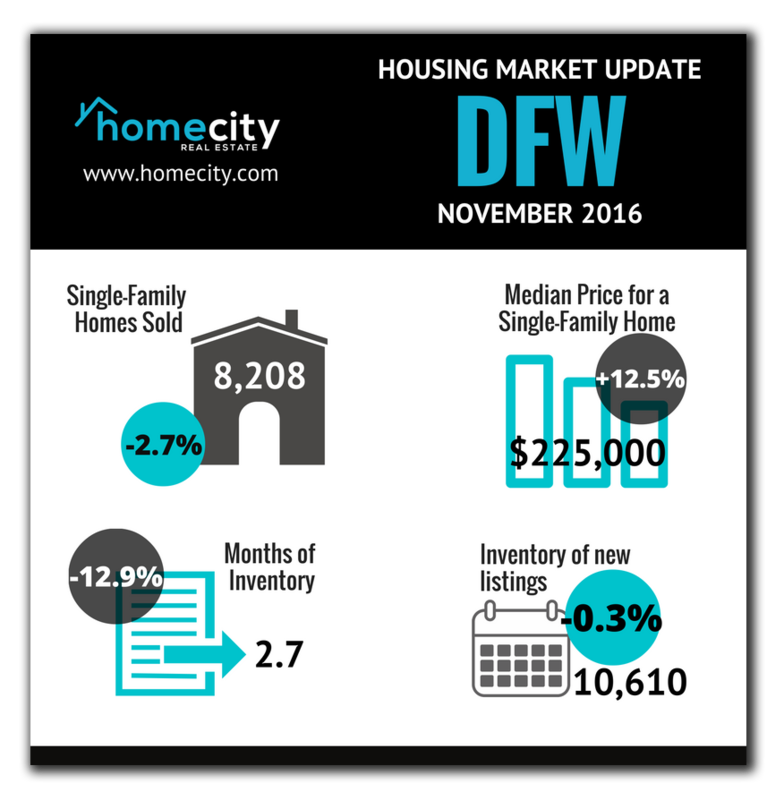 New listings were down 0.3 percent in the DFW area, sitting at 10,610. Inventory shrank 8.9 percent to 24,545 homes for sale. Closed sales were down 2.7 percent in October 2016 with 8,208 homes sold. Days on the market also decreased 6.8 percent to 41 days, and month’s supply of homes also dropped 12.9 percent to 2.7 months. As a reminder, the Texas A&M Real Estate Center cites six months as a balanced market, which we are well below. Supply and demand is in full effect, and the median home sales price rose 12.5 percent to $225,000. Owners who sell are receiving 96.7 percent of their original list price, which is up 0.6 percent from this same time last year. Despite this rise in median home sales price, the DFW Metroplex remains one of the more affordable choices for buying in the US. Point2Homes released their latest data comparing home prices around the United States, and how much home one can afford in various cities for $300k. Manhattan and San Francisco topped the list for most expensive markets (not surprising), and they found you could buy four median sized houses in Detroit for $300,000, as well as two in Memphis. Dallas falls somewhere in between the two where $300,000 will get you an average of 1,657 square feet of space. Fort Worth comes in with even more affordable numbers at $300k buying you an average of 2,830 square feet of house. If these kinds of stats interest you, they’ve created a very handy infographic (below) and accompanying article. Square footage price is a universally accepted metric that works very well if you want to have a general idea about how much house you can get for your money in a particular city or area of interest. That being said, it’s definitely not a perfect metric: location, property type, amenities, and other factors play a significant role as well. However, most stats point to the Dallas and Fort Worth areas being incredibly affordable when you consider the amount of house you get for your money. That coupled with the amenities and vibrant Texas culture make DFW an ideal place to settle down.